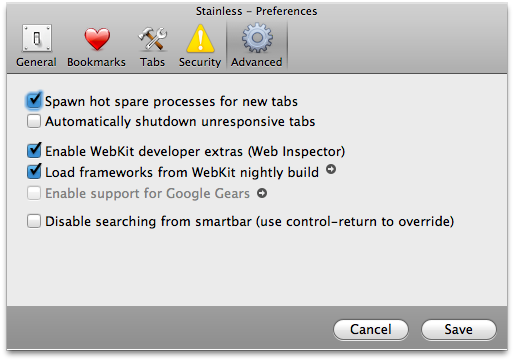 A few months ago I stumbled upon this new browser for Mac called Stainless and I immediately realized the developers had big plans for it. The browser was fast, stable, it featured a simple and uncluttered UI and some good features which made it stand out from the crowd. 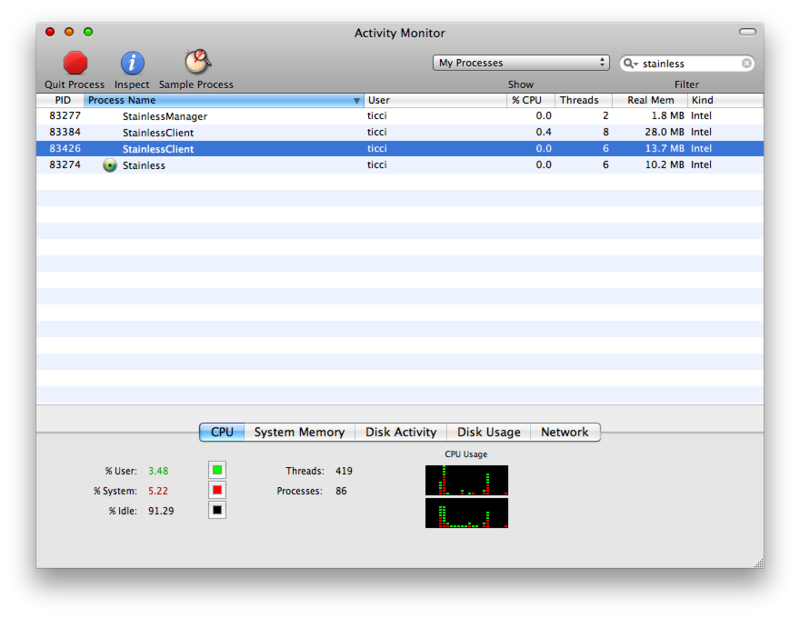 I really appreciated the "tabs as single processes" thing, inspired by Google Chrome. But now that Chrome is out on the Mac as well and Mozilla is working hard on the next version of Firefox (the much anticipated 4.0 version that will hopefully refresh the whole interface) is Stainless still the new kid on the block of Mac browsers worth a look, or is it just a geek alternative to Safari, Chrome, whatever? Could it be your new default browser? First, Stainless comes with a simple and crisp interface I wish Safari, Chrome and Firefox were inspired by. There are no additional buttons cluttering the toolbar, just back/forward and the Home button. If you're that kind of user who doesn't require so many stuff while browsing, you're gonna like the minimalism of Stainless. But this browser has some nice eye candy too: while typing into the address bar the history doesn't expand like in,say, Safari: instead of the typical dropdown menu, Stainless displays a gorgeous HUDish menu. Awesome. Enough for the interface (just take a look at the screenshots), let's see how this Stainless.app actually works as a browser. 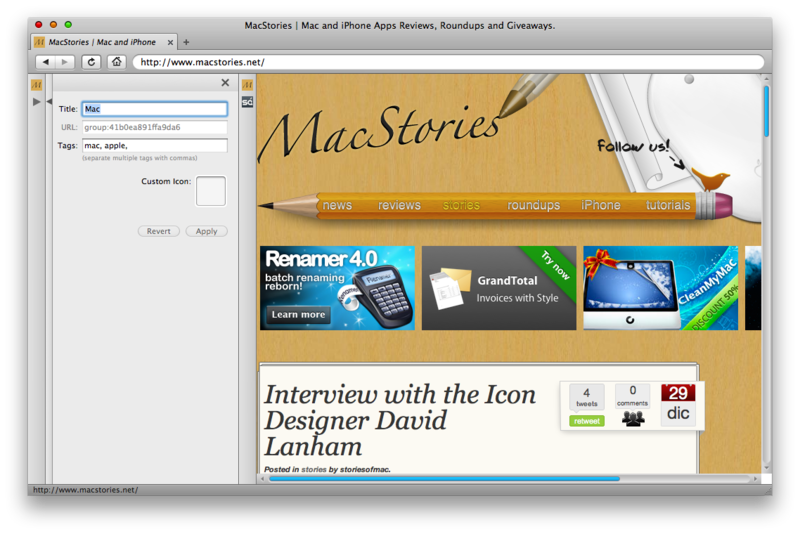 Stainless is based on Webkit: same speed of Safari, same engine, same everything. It's Safari in the core, just another thing to your eyes. What I like most about it it's that you can opt to run tabs as single processes: much like Chrome does, every tab is independent from the rest of the browser and runs as a standalone process in Activity Monitor. What does it mean, exactly? It means that you won't see the browser go beachballing anymore. 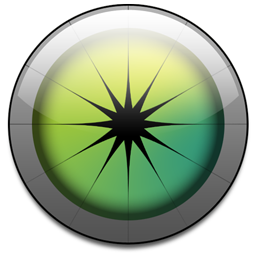 And if you hate Safari's beach ball as much as I do, you'll welcome Stainless as the new Messiah.app. A flash page made Safari crash together with every tab you had open? That won't happen anymore if you choose to run tabs as processes. As for speed, I found Stainless very fast, maybe even faster than Safari itself sometimes, and it completed the Acid Test with a 100/100 score. Also, you can turn on Webkit's developer extras make Stainless load frameworks from Webkit nightly builds from the Preferences. Awesome. But what about the navigation experience itself? A modern browser should provide many features to make every kind of user comfortable with it. Stainless takes a very different approach than Safari and Firefox, showing a totally uncluttered UI which doesn't even have a bookmarks toolbar. You can save bookmarks in a vertical "shelf" which stays on the side of the main browsing window. In the shelf you can drag tabs' favicons to create a single bookmarks or you can also create a new group of bookmarks from tabs. Then, you can click on the newly created folder to reveal the websites inside it or open all in new tabs. Too bad they override the tabs you've already open, the developers should fix this. 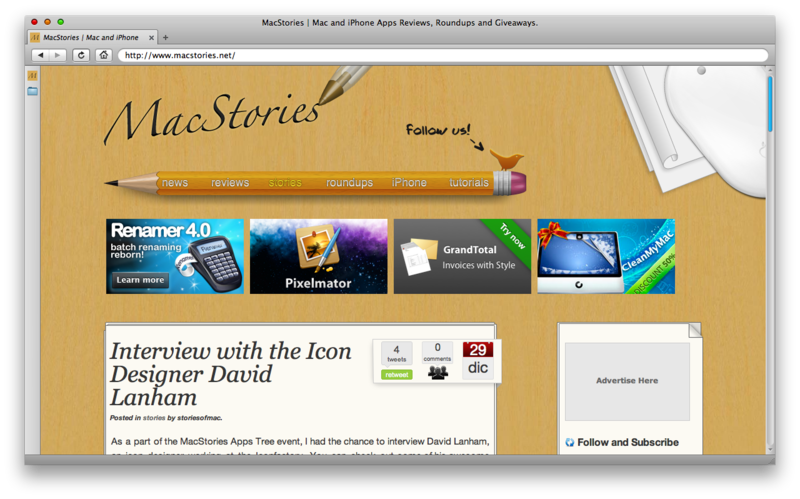 Tabs are draggable, but there's not the same beautiful animation Safari 4 has. Last, another thing I liked about Stainless is the possibility to start "single sessions" tabs: it's not about the process, it's just that you'll be able to log into the same websites with different accounts in one Stainless instance. So, you can fire up Stainless, start two single session tabs and log into Twitter with two accounts. Very useful. I've been plain' around with the latest build of Stainless for a while now, and I must admit I'm really satisfied. It's stable, fast and definitely gets the job done. But let's face it, I don't know if it can really replace Safari and Firefox for now. The developers must work hard on keep adding features - even if they aim at creating a simple and clutter free browser - because people need a browser capable of doing what they want. I mean, what about all the plugins Safari and Firefox have? How am I supposed to quickly post a bookmark to delicious in Stainless without DeliciousSafari? That's definitely a tough question. And what should MesaDynamics do? Implement SIMBL support and let the user base do the rest, or create a minimal, yet feature rich browser? A browser that has built-in support for Twitter, Delicious, Gmail etc? That would be an immensely hard task. So what's the point about this Stainless, you may ask. Well, I think it's just about you in the end. Sit down for a second, close Tweetie and ask yourself: "What do I really need to do with my browser?". If 20+ must-have plugins flash before your eyes, don't dowload Stainless. But if you realize that you could also live with a not-so-complete browser, then you should give it a try. The app is weekly updated and the processes / single sessions tabs features are interesting and worth a look. For me, Stainless won't replace Safari anytime soon anyway: I'm forced to use many plugins and tweaks to get things done faster for MacStories, but I'd be really happy to give Stainless another spin someday. The question is not if this market allows a new browser to enter the war, but if your Dock needs it.